Unfortunately those who dedicate their lives to animal advocacy far too often come across individuals, who by way of their own choices refuse to acknowledge the terrible truth about the continued brutality waged against animals with whom we share this planet. In some cases, it is a lack of awareness, failing to do their own required research before they make ridiculous and uneducated comments. They, by their very own omissions of action, remain blissfully ignorant of the facts, statistics, undercover videos, documented cases and published testimonies and accounts that are witnessed by those dedicated to saving animals. There are those too, who, because they state it is too difficult for them to view pictorial and or video evidence fail to appreciate the horrific suffering of animals around the word. Just the other day, I commented on a Blog Post: “Horses need a Humane society” to which one response rather blew me away. The response implied the spread of rumours that could not be proved as well as innuendo. Obviously the individual has failed to spend the needed research time, and while may be passionate in feelings towards horses on a personal level, insults those of us who do put in the endless hours necessary giving these magnificent equids a voice. Photos provided from CFAWR: horses awaiting slaughter. 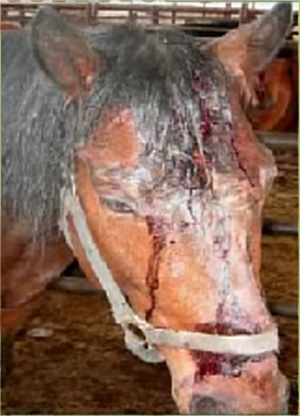 Per CFAWR: often the horses eyes are gouged so they are unable to see and protect themselves. 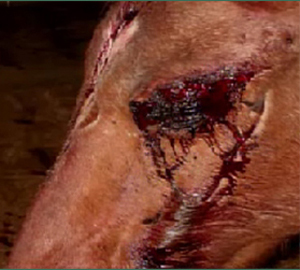 The CHDC published a very informative report: “Black Beauty Betrayed” the Slaughter of US and Canadian Horses: a report on equine slaughter at Natural Valley Farms Horse Slaughterhouse in Neudorf, Saskatchewan: April 27 – May 1, 2008. This report is a MUST read for all who believe in the sanctity of life period. The CHDC received both video footage and pictorial evidence in May 2008 from an unknown source as to what was actually taking place at the Natural Valley Slaughterhouse. The pictures and videos are terrifying and extremely graphic, as a courtesy to my readers I must warn you. A great many people are dedicated to saving horses not only in Canada and the US, but around the world as well. Many of these individuals such as Craig Downer, author of “The Wild Horse Conspiracy”, another MUST read; Katia Louise film maker of “Saving America’s Wild Horses: A Nation Betrayed; Monika my Colorado contact; The Equine Welfare Alliance, The ‘Cloud Foundation’ and of course the Canadian Horse Defense Coalition..not to mention countless others as myself who continue to get the message out and to give these beautiful creatures a voice. Sadly there will always remain those who will continue in their pro horse slaughter campaigns, spewing out their lies and propaganda to aid in the continued annihilation of wild horses both in Canada and the US to fuel their greed. Sadly there will remain those individuals who voice un-educated comments that, if anything, point to a lack of knowledge and real understanding (having failed to learn the truth by researching the facts). Sadly companion horses will continue to face the brutality and horrific deaths in slaughterhouses within Canada and Mexico..the US banned their own slaughterhouses years ago however there is a real push on now by pro-slaughter supports such as Wallis to have them re-opened. Canada continues to import US horses into this country for slaughter. This horsemeat is then shipped overseas, may wind up in pet foods, and has already been declared unfit for human consumption. 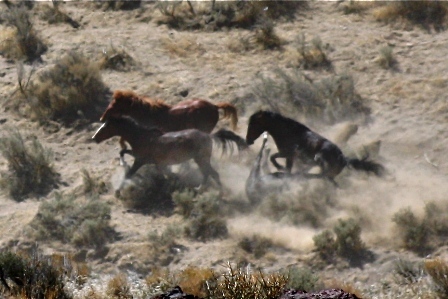 The pictures below are published with the permission of my Colorado contact and show show the continued inhumane roundups conducted by the US Bureau of Land Management. 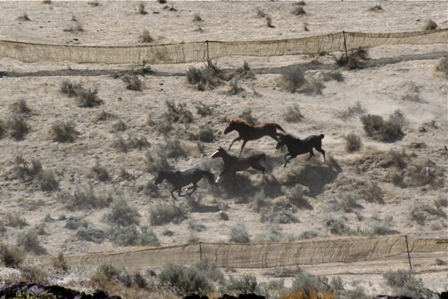 These wild horses are being rounded up for slaughter, often times being knocked off their feet by helicopters used by the BLM. 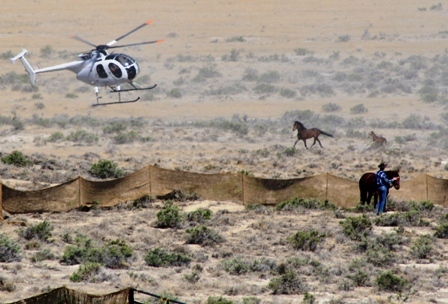 THE BUREAU OF LAND MISMANAGEMENT DOES IT AGAIN, AND THEY ARE ROUNDING UP THE USUAL SUSPECTS — THE WILD HORSES, OF COURSE — AND CHASING THEM WITH HELICOPTERS IN THE HEIGHT OF FOALING SEASON. How did it come to this? There are many states here in the US that are trying to bring horse slaughter to their state. One is our state of TN. Their platform is there needs to be a humane way to deal with the problem of animals that are old and infirm (because apparently there are no vets to do that). But when then we find those that support these laws are those in the show horse industry that are looking to make a buck off those many horses that don’t make it in the show horse industry. The excuse that “there are no vets to do that”….more lies and propaganda spewed from the pro-slaughter groups. Veterinary medicine provides for the needs of the cattle industry does it not!! Vets provide for the needs of the horse racing industry does it not!!! A horse who is critically injured during a race, (falls breaks it’s leg) is humanely relieved of its suffering. A calf that may be breached during the birth process, is assisted by a qualified medical professional. To say that there “are no vets” available to humanely euthanize an aging equine is ridiculous. Those that prefer to send their aged equines to slaughterhouses, in my opinion, and I am allowed my opinion, are those those individuals who wish to glean the last profit they can from these animals, do not wish to participate in the actual destruction of their animal and prefer to remain blissfully ignorant as to the horror and terror that their animal is about to face. Much easier to dig the deeper hole in the sand to bury one’s head in and to wash their hands and justify their actions by saying the animal was old and perhaps suffering. These people need to tour an actual slaughterhouse, be on the trucks that are crammed with horses that too often travel up to 20-40 hours without food, water and rest..to make their way to Canada and Mexico..then be brutalized by profit mongers. Canada and Mexico need to say NO to import of horses. NM horses are already banned as are throughbreds. Stop making money off the murder of horses for your own sake. There is no good in it and is a reason tourist dollars are less. Tell La Taste and La Pallet to stop serving horsemeat. If slaughterhouses had glass walls no one would eat it. The chemicals (up to 100 different ones) are linked to cancer. You are what you eat! Thank you for your support. I do not know what it will take to end the slaughter of these beautiful equines, certainly Canada plays a major part in supporting these horrors by importing US horses into this country. 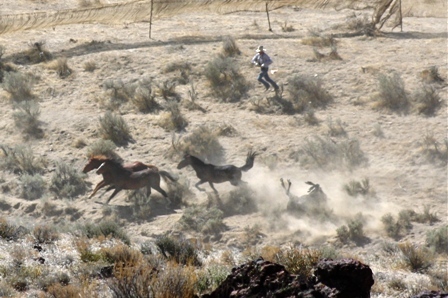 The fact that our own wild horses suffer the same fate as the US horses, is disgusting. So very few in the public realize what is going on, what happens to the retired stampede, show and race horses once they are no longer useful. Very few know of the nurse mares whose foals are immediately killed off so that these nurse mares can feed the more valued race horses. Greed fuels these horrors.